I stumbled across a package of cheap steaks the other day at the grocery store. Chuck tender steaks to be exact. They had a deep red beefy color, were thin sliced, and looked tender. Their middle name is even "tender". But I knew better. 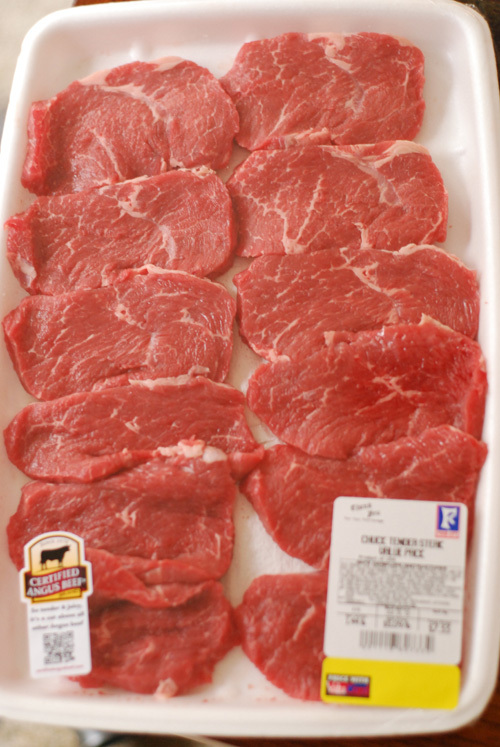 Chuck tender steaks are obviously from the chuck or upper shoulder of cattle. That muscle group is heavily exercised and full of connective tissue. 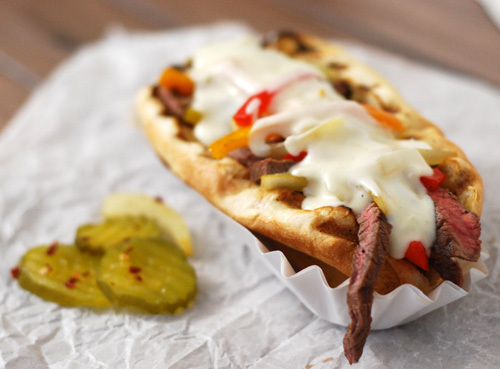 So while it does have a rich beef flavor, it tends to be anything BUT tender. I had a couple of strategies planned to deal with that. Marinade - The acid in the marinade helps weaken muscle tissue however marinades take quite a while to penetrate. Mechanical Tenderizing - A meat cuber, jaccard or even a fork can be used to help break up the connective tissue of tough meats before cooking. Note: I'd never use that on a quality thick steak. 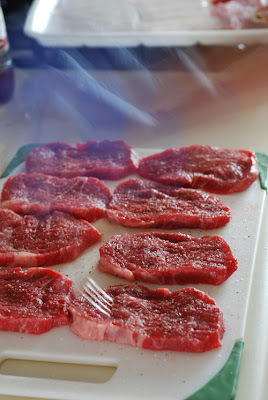 Thin slices - the thin steaks were already cut across the grain when cut into steaks. That minimizes long muscle fibers which are chewy by nature. 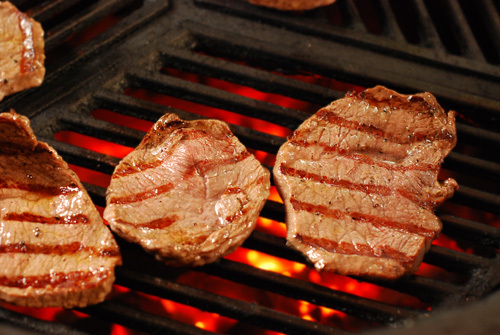 Medium rare - These steaks can't be taken past medium rare or they will toughen quickly. 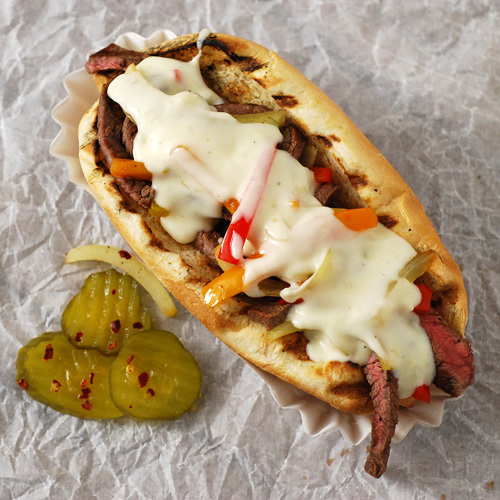 I decided to make some steak sandwiches with peppers, onions and an excellent garlicky cheese sauce. First I seasoned the steaks with salt and pepper on both sides and then stabbed them repeatedly. This helps tenderize AND drives seasoning into the meat. Lightning fast reflexes, ha ha. Next is a brief marinade for about 2 hours. I used 3 oz oil, 1 oz red wine vinegar, and 1 Tbsp of Worcestershire sauce. While it marinated, I made the cheese sauce. Saute the garlic in butter until just starting to turn golden. Add the flour and stir continuously to form a light roux. Stir the cream into the dish in increments, stirring to combine each time before adding more. Season with salt and pepper and then stir in cheese in batches until well combined. Whisk in the milk to get the consistency you want. I probably used about 1/2 cup. I preheated my Big Green Egg to 400f and grilled the steaks for about 45 seconds a side. I went by visual cues. Once the meat began to darken slightly around the edge and the juices slightly pool on top, I flipped them. 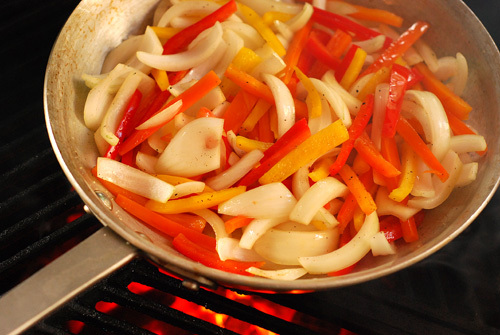 Next was a quick saute of peppers and onions seasoned with salt and pepper. Of course, I grill toasted my buns. 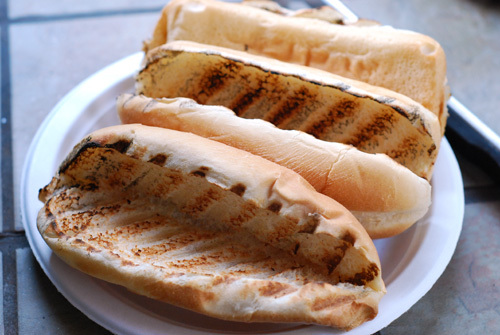 I like having toasty buns, don't you? The sandwiches were to die for, according to Alexis and Trevor. I tend to agree. I will buy this cut of beef again. It has the rich beef flavor that you expect from steak and with all of the tenderizing tricks, it was supple. I could see using this for fajitas as a substitute for skirt steak. I'm not saying it's the same as ribeye or flank steak but it's also half the price and good eats. Some other methods for making tough meat tender that I did not use here include enzymatic tenderizers (meat tenderizer powders), dry aging (meat's own natural enzymes), and low/slow moist cooking. What are your favorite tricks for turning shoe leather into delectable meat?